Your squares are beautiful, as are all your works in progress, looking forward to seeing them progress. Umm you did so hit the nail on the head with heads full of more projects just before sleep-a dangerous part of the day! For iphone (I guess it goes for ipad too) I love - Camera Plus (to take photos), Waterlogue (turns your photos into watercolours), Aviary (to edit photos). Thank you Elena, I have looked at Waterlogue but so far am trying to limit myself to free apps - once I start paying it's a slippery slope and I fear I'll download everything! The problem for me with Pinterest is that it gives me too much ideas - and then I don't know anymore where to begin. 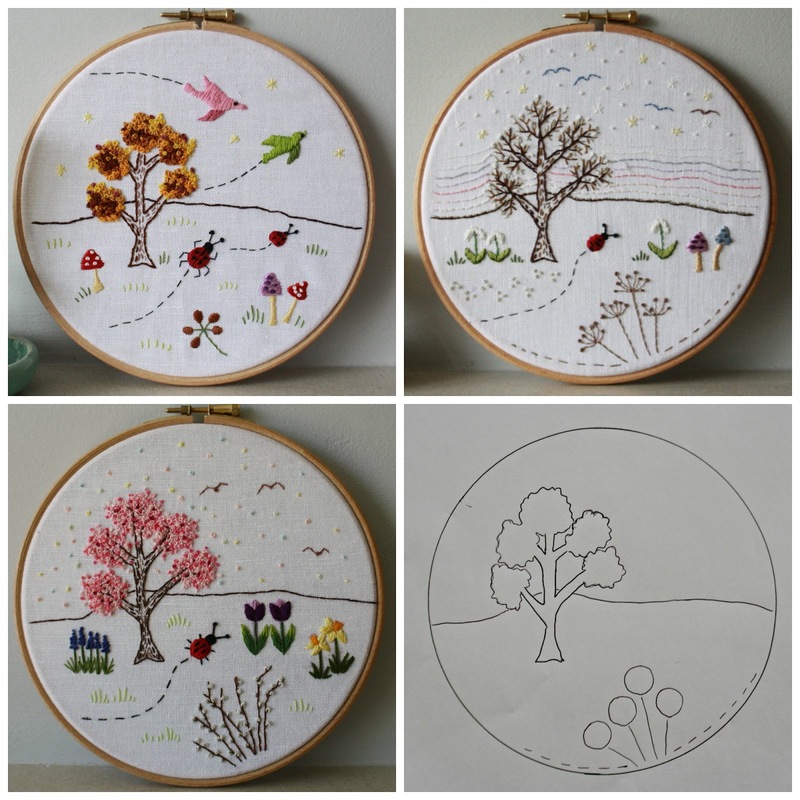 Ps can't wait to see your four seasons embroidery complete ! That was clever! You have a very full head of ideas. I am in awe of your head. My head echoes I'm sure of it. I love the colours in your blanket squares - it's going to be a stunner I reckon. I don't have an Ipad but would love one ..... need to save my pennies. Love your WIP's and am definitely going to investigate the V & A site. Your blanket is coming on really well and looks gorgeous. I love your embroideries and wall hanging too. I use some of the tools you've mentioned but it's good to learn of some other useful ones. I've been thinking of chaging to an iPad or MacBook so I'm glad to know you're impressed with it. It's the way to go, I think! Love your WIP!!! Thanks for the handy hints, I knew some but there are a few I want to explore soon!!! Have a fab week!!! All your WIPs are lovely, Gillian. 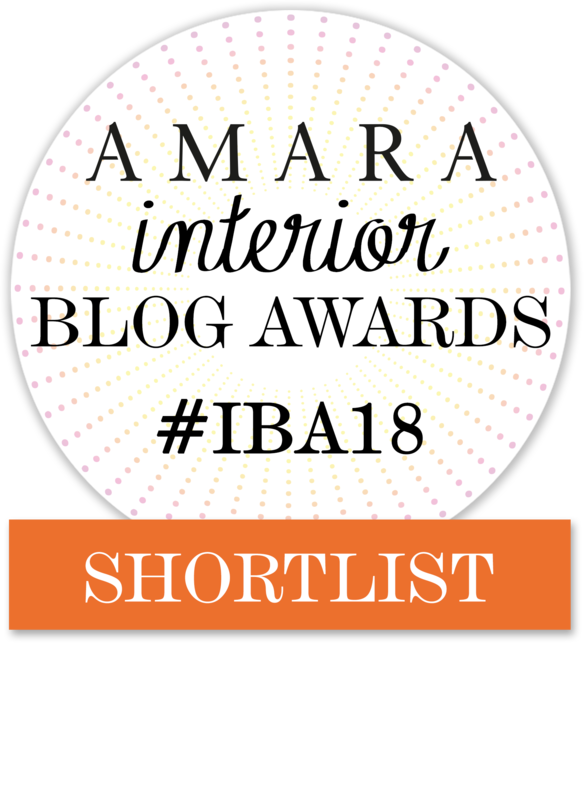 I daren't look to see how many I have tucked away...I agree with Ingrid's comment above in that there is so much to be inspired by on other folks' blogs. 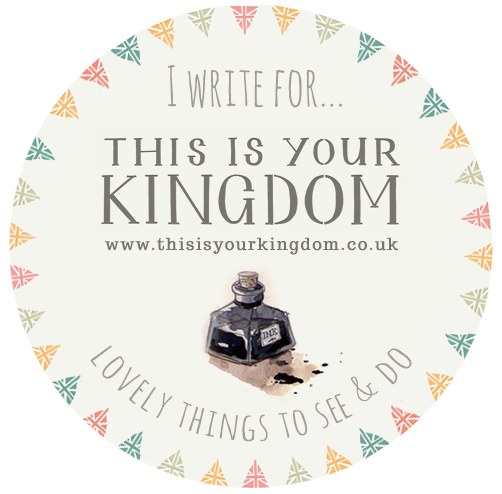 I've recently started following you on Bloglovin'. My inspiration comes from blogs, which I find a little more honest sometimes than some of the magazines. Incidentally, I don't know if it applies in your area, but in Essex we can download magazines for free using our library card. The range isn't vast, but it encourages me to read magazines I wouldn't normally buy (same of course applies to borrowing books). Your blanket is looking wonderful though I don't envy you the stitching together. Your blanket is going to be so beautiful - keep going, there is light at the end of the tunnel ! Your blanket is going to be stunning! thank you so much for all the hints and tips, I am going to check out the V & A website. Thanks for the tips - I'm not an iPerson sadly, but am addicted to Pinterest and always use PicMonkey for photo editing. I upgraded to get more effects etc. and am glad I did. I hope you get your blanket finished so you can enjoy it over the coming months - it looks lovely already. The wall hanging looks amazing so effective. I have an i Pad are really just use it to read and for work. I am a bit of a loser that way. I think you next post should be just like this one with all the advice you get for the i Pad. Love your blanket. I have a long list of things I want to make and as I finish one I seem to add another two or three. So it just goes on and on. Thank you for this really interesting post. You have suggested lots of things to read and try. Great WIP's Gillian!! Yes, I have an EnoRrrrmous list of "want to do's" in my head. Thanks for the Granny Squares app. I like to use Pic Collage to make collages of my photos for my blog - easy to use and great fun. If only I had just three W.I.Ps on the go I Might even finish them. Your blanket is gorgeous and worth taking the time over. I have booklet that I use to write down (some of my very many) crafty ideas as well - and I love craft books, too. I also find that many yarn compagnies ex. have very inspirational homepages. And then there's Ravelry! Oh my list of WIP's is embarrassing. I have made some progress this week though which has been really nice. I have followed you from IG to your blog and I must say that it is lovely. That wall hanging is fabulous. 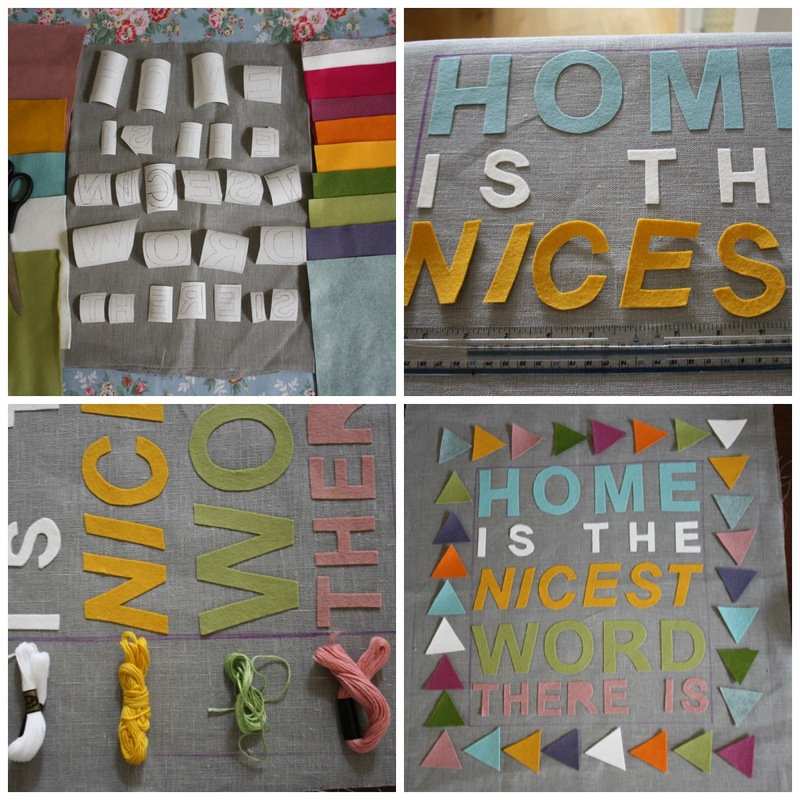 I use Pic Monkey a lot for text for projects - mostly stitchy ones. All of your projects are beautiful....it's healthy to have a few projects on the go I think! You have given me some good ideas for craft inspiration there thank you. I actually find books more inspiring than anything really, I adore craft books especially crochet and knitting ones. I joined Pinterest and thought I would love it but I rarely look at it at really, same with Ravelry I joined that too and I dont actually think I have been back on there since I joined. Other blogs are very inspiring to me as well actually. Apps! Well, I will be having a look at the ones you have mentioned. I have recently discovered Instagram and I love Blogsy which I use for all my blog posts. wow - your blanket is impressive, but I agree, I can see that is a "slow burner". I find Pinterest a real inspiration for me and also I like Ravelry (for knitting and crochet ideas). I'm quite impressed with how restrained you are at having just 3 WIPs! Gorgeous craft projects, you have such a lovely way with colours. I'm loving the crochet blanket, it's gorgeous. Another Evernote fan here, and I like Oggl for image editing (although I have over 20 other photo editing apps.) Watch out for storage issues if you're downloading a lot of image heavy magazines and only have the 16GB model you've linked to, e.g. Pure Green Magazine, which I linked to in a recent post, is using up 1.4GB on my (luckily 64GB) model.